Biblia: Dat is, De Gantsche Heylighe Schrift, grondelick ende trouwelick verduytschet. Met verclaringhe duysterer Woorden, Redenen ende Spreucken, ende verscheyden Lectien, die in andere loflicke Ouersettinghen Gheuonden, ende hier aen de cant toeghesettet zijn. Met noch rijcke aenwijsingen, der ghelijck ofte ongelijckstemmenden plaetsen, op het allergewiste met Scheydletteren, ende versen getale (daer een yeghelick Capittel na Hebreischer wijse, mede onderdeylt is) verteeckent. Noch zijn hier van nieus toegedaen die Caerten na de Copie der Fransoyscher Bybelen, diendende den Christelicken Leser tot verclaringhe des texts. Corographiae Terrae Sanctae in Angustiorem formam Redacta, et ex Variis Auctoribus a Multis Erroribus Expurgata. 1580. Veduta cartografica in oblungo, più volte ripiegata, raffigurante la Terra Santa, 18 piccoli riquadri ai margini mostrano il tempio e i suoi strumenti. Cartografata e stampata da Jacobus Tirinus (1580 - 1636), la carta uscì ad Anversa nel 1632. La carta presenta al centro la pianta di Gerusalemme basata sul celebre modello di Villalpando, pubblicato nello "Hierosolymae Veteris Imago". Rara. Esemplare stampato su carta fine, carta velina applicata al verso, stretti margini, una piccola abrasione interessa la parte centrale del foglio e una, rimarginata, la parte sinistra dell'inciso da un terzo superiore del foglio fino al margine inferiore. Nell'insieme resta comunque fruibile la lettura della carta e l'esemplare si presenta con una buona impressione dell'inciso. HEIDE. "Icon oppidi Heide". Gesamtansicht (18 x 38 cm), darunter Gesamtansicht von Meldorf. - Altkol. Kupferstich aus Braun-Hogenberg, um 1580, 36,5 x 38 cm. Fauser 8681 (Meldorf) und 5544 (Heide). - Schönes, wohl erhaltenes Altkolorit. MELDORF. "Delineatio urbis Meldorpie". Gesamtansicht (17,5 x 38 cm), darüber Gesamtansicht von Heide. Large woodcut printer's device on each title & numerous woodcuts & illus. and printed tables in the text. 470,  pp., one blank leaf; 217,  pp., two leaves of dedication. Two parts in one vol. Large 4to, cont. binding from the south of France of red morocco (rather browned throughout as always with this book due to the quality of the paper, some minor worming towards end touching a few letters & carefully repaired), arms in gilt on covers of FranÃ§ois de Rignac (1580-1663; see below), roulette border in gilt round sides, spine gilt. Frankfurt: J.G. SchÃ¶nwetter, 1648. First edition of this collection of writings on the famous new star of 1572-74 (first part) and the equally famous comet of 1577 (second part); this edition, containing two of Tycho's most important works, is rare on the market. It was his observations of these two astronomical phenomena - here printed - that compelled Tycho to abandon the Aristotelian theory of the universe and replace it with his own geoheliocentric system. This was an enormously important step in the acceptance of the Copernican doctrine. Many of Tycho's instruments - sextants, quadrants, and various armillae - are well-illustrated here. 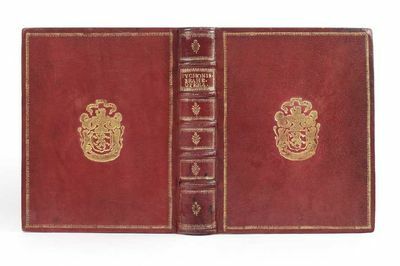 This copy belonged to FranÃ§ois de Rignac (1580-1663), attorney general of the Cour des Aides de Montpellier and bears his arms on the red morocco covers (Olivier-Hermal-de Rotton, pl. 1902). The binding of this superb copy is typical of the workshops of the south of France, especially that of Corberan, the binder for Peiresc. Though FranÃ§ois de Rignac married a certain Jeanne de Fabry in 1627, she was apparently not closely related to Nicolas Fabri de Peiresc, a native of Aix, even though this copy could imply family ties. In 1682, according to LÃ©opold Delisle, Colbert received a gift of one hundred and four manuscripts of Mr. de Rignac, councilor to the Cour des Aides de Montpellier and heir to the books of FranÃ§ois de Rignac. In their Histoire du Languedoc Vic and VayssÃ¨te relate that in 1677, Ã‰tienne Baluze had already discovered the library of the "late Mr. de Rignac." It is most unusual to see this book is such a fine contemporary binding. In this copy, the two leaves with the dedication are bound, as is often the case, at the end of Part II (like the Harvard copy). Preserved in a box. ? Houzeau & Lancaster 2704. For de Rignac, see Guigard, II, p. 413. 8 p.l., 361,  pp. Small 8vo, cont. flexible vellum, ties gone. Paris: Martin le Jeune, 1580. First edition, and a splendid pure copy in its first binding, of a rare and important book in the history of chemistry, hydrology, geology, agriculture, etc., etc. Palissy (ca. 1509-89), who is best known for his discovery of the secret of enamelling pottery, was far in advance of his time in scientific ideas. The "Discours admirables, probably incorporates Palissy's Paris lectures. Itâ€¦deals with an impressive array of subjects: agriculture, alchemy, botany, ceramics, embalming, engineering, geology, hydrology, medicine, metallurgy, meteorology, mineralogy, paleontology, philosophy, physics, toxicology, and zoology. The book is divided into several chapters, the first and longest of which is concerned with water. The others take up metals and their nature and generation; drugs; ice; different types of salts and their nature, effects, and methods of generation; characteristics of common and precious stones; clay and marl; and the potter's artâ€¦ "Palissy's views on hydrology and paleontology, as expressed in the Discours, are of particular interest. He was one of the few men of his century to have a correct notion of the origins of rivers and streams, and he stated it forcefully, denying categorically that rivers can have any source other than rainfallâ€¦ "Palissy discussed fossils extensivelyâ€¦[He] held other advanced views. From experimentation he concluded that all minerals with geometric crystal forms must have crystallized in water; his classification of salts was nearly correct; and he suggested the concept of superposition for the development of sedimentary rocksâ€¦ "Palissy was probably one of the first men in France to teach natural sciences from facts, specimens and demonstrations rather than hypotheses. "-D.S.B., X, pp. 280-81. In the eighth section, Palissy investigated the hardness and properties of gems and precious stones. The Discours was written in the form of a dialogue between "Theory" and "Practice" and it is always "Practice" that instructs "Theory." A fine copy in its first binding, preserved in a box. Contemporary signature on title of "G. Passart" (maybe) and with a number of knowledgeable contemporary notes in many margins. This book is extremely rare; Ferguson acquired his copy, now in the University of Glasgow, after years of searching and has written on the flyleaf: "At last, after long, long waiting and watching." It is one of the very few books in Denis Duveen's collection of which he reproduced the title-page in his Bibliotheca Alchemica et Chemica. ? Adams, The Birth and Development of the Geological Sciences, pp. 90, 261, & 446-48. Brunet, IV, 319-20 & Suppl., II, 133-"une piÃ¨ce aussi intÃ©ressante que rare." Duveen, p. 446-"A book of great importance in the history of chemistry and science generally." Geikie, The Founders of Geology, pp. 104 & 118. Hoover 621. Partington, II, pp. 69-77. Zittel, pp. 18 & 132. (Bamberg, Joh. Wagner), 1580.. Mit blattgr. Titelholzschnitt und 21 teilw. blattgr. Textholzschnitten von J. Amman, W. Traut und W. Katzheimer. 4 Bll. (l. w.), 72 numm. Bll., 1 Bl Druckvermerk, 1 w. Bl., 18 Bll. Register. Rot eingefÃ¤rbter Pergamentband mit Wappensupralibros auf den Deckeln und neuen SchlieÃŸbÃ¤ndern. 30 x 21 cm. VD16 B 266; STC 64; Fairfax Murray 457 Anm. (mit Abb. ); Becker, Amman 139; Hollstein II, 25 u. 43; Benzing, Buchdrucker 26 ("Die `Peinliche Halsgerichtsordnung` von 1580 war seine hervorragendste Leitung"). - Neue, revidierte Ausgabe der berÃ¼hmten "Bambergensis". - Die von dem Bamberger Hofmeister Johann von Schwarzenberg ausgearbeitete und 1507 verÃ¶ffentlichte Halsgerichtsordnung gilt als bahnbrechend fÃ¼r die deutsche Strafrechtsreform zu Beginn des 16. Jhdts. und als Vorbild fÃ¼r die "Carolina". Aus den anderen frÃ¼hen, regionalen StrafgesetzbÃ¼chern ragt sie "wegen der geschickten Zusammenfassung des einheimischen Rechts mit den bereits eingedrungenen, fremden rÃ¶misch-italienischen Rechtselementen" heraus (Kaspers 132). Angestrebt wird eine grÃ¶ÃŸere Rechtssicherheit im InquisitionsprozeÃŸ durch geregelte Ermittlungs- und Beweisverfahren, klar definierte StraftatbestÃ¤nde und Strafen, die der GrÃ¶ÃŸe der Schuld entsprechen (vgl. Kleinheyer-SchrÃ¶der S. 238). Das GestÃ¤ndnis wurde als zentrales Beweismittel definiert und dementsprechend die Folter als Mittel zu seiner FÃ¶rderung beschrieben. - Die Holzschnitte geben ein eindrucksvolles und anschauliches Bild der Strafverfolgung mit ihren einzelnen Elementen wie Verhaftung, VerhÃ¶r und Folterungen, Urteilsfindung, Hinrichtungen, Kostenbegleichung etc. - Der Titelholzschnitt mit dem Wappen des Bischofs Johann Georg Zobel von Giebelstadt und der blattgr. Holzschnitt mit der Darstellung des JÃ¼ngsten Gerichts rÃ¼hren von J. Amman her und wurden von L. Mayer geschnitten. Die Ã¼brigen Holzschnitte stammen zum groÃŸen Teil von den StÃ¶cken der ersten Ausgabe 1507. - Etwas gebrÃ¤unt, tls. leicht fleckig. Sehr gutes Exemplar! MÜNSTER. - Osnabrück. - Karte. "Reiterata Episcopatus Monasteriensis . et Osnaburgensis". - Altkol. Kupferstich von J. und J. Doetechum nach G. Maschop, um 1580, 36 x 45 cm. Tooley S. 216. - Nicht genordete Karte der Bistümer Münster und Osnabrück. - Mit großer altkolorierter Titelkartusche links unten und in schönem alten Flächenkolorit. - Gerahmt. emendatum et notis illustratum, Gregorii XIII. Pont. Max. jussu editum. Libro VII. Decretalium et Jo. Pauli Lancelotti Institutionibus adauctum. 2 in 1 Bd. Basel, E(manuel) u. J(ohan) R(udolf) Thurneysen, 1717. 24,5 : 19 cm. Titel von Bd. 1 in Rot- u. Schwarzdruck, 2 Druckermarken u. 2 Schlußstücke in Holzschnitt. 54 Bl., 1280 Sp. ; 10 Bl., 754 Sp., 3 Bl., 404 Sp., 34 Bl. 2 Bl., 236 Sp., 5 Bl., 3 Bl., 158 Sp. Pergamentband d. Zt. ; fleckig, vord. Gelenk mit kl. Beschädigung. - Schöne, meist zweispaltig gedruckte Ausgabe des Corpus Juris Canonici in der seit der von Papst Gregor XIII. 1580 angeordneten Revision bis 1917 gültigen Fassung. Die gleichzeitige Anwendung von dem im Corpus Juris Civilis zusammengefassten römischen Recht und des kanonischen Rechts, das in vielem auch in den außerkirchlichen Bereich (z.B. im Schuld- und Eherecht) hineinreichte, führte im Zivilrecht schließlich zur Ausprägung des das Rechtsleben in Kontinentaleuropa beherrschenden, sog. Jus commune oder Gemeinen Rechts. Deshalb war es bis zu den Zivilrechtskodifikationen des ausgehenden 18. und des 19. Jahrhunderts für Juristen üblich, wenn auch nicht verpflichtend, "beide Rechte" studiert zu haben. - Bis auf wenige kl. Flecken, sehr gutes und sauberes Exemplar. Innendeckel und Titelblatt mit Namenseinträgen zweier Vorbesitzer. Missa Beatae Virginis Mariae [Illuminated manuscript on vellum in Latin, by Bordonius?]. Italy (probably Genoa): c. 1580. 12mo in 4s, 106 leaves, complete. With seven full-page miniatures and initials throughout in gold. Collation: :*2 ; A6 ; B- M4 ; N6 ,O â€“ Z4 ; &6; *2 The last blank leaf has been used as a flyleaf. Written in brown ink with red titles, italic script, single column, 16 lines. Leaf dimensions: mm. 115 x 70; written space: mm. 76 x 46. Text framed by colored lines. Old (c. 1750?) gold-tooled calf binding, rebacked. A lovely example of a late 16th-century Italian chancery hand with miniatures, and a fascinating example of a manuscript made to look like a printed book (as opposed to 15th-century printed books made to look like manuscripts). A similar manuscript sold in 1989: â€œ170 leaves, vellum, 98mm by 62mm. Late 19th-cent German silver bdg with repousse scenes. In black & red ink in a fine calligraphic sloping italic hand by Hieronymus Bordonius. With c.180 illuminated initials in imitation of ptd initials, full-page armorial title, & half-page & 11 full-page pen-&-ink drawings in imitation of engravings. - Sotheby's, Jun 20, 1989, lot 74, Â£9,000 ($13,979)â€. f. Z4v Hours of the Holy Spirit. f. *1v St. Hieronymus, f. *2 Coronation of the Virgin. f. *2v Unidentified Coat-of-arms. f. B2v Annunciation, f. I2 King David, f. N2 The Pentecost. 1580. Copper engraving, by Marelli, mm 133x90. 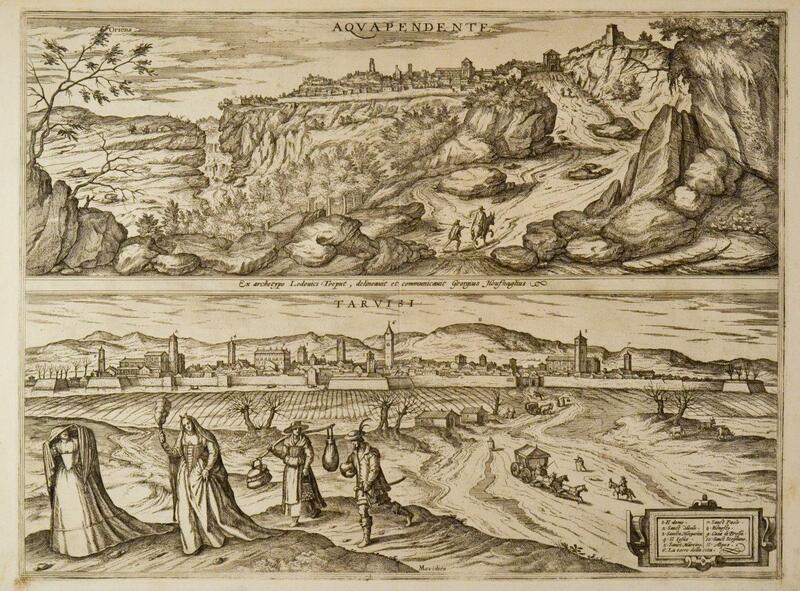 Rare map of Naxos from "Diporti notturni".Very good example, right margin short. Hecatommithi, overo Cento Novelle di M. Giovanbattista Giraldi Cinthio [...]. Venedig, (Francesco Rampazettos Erben für) Fabio & Agostino Zoppini, (1579-)1580. 1580. 2 Teile in einem Band. (8), 251 Bll., l. w. Bl. 232, (8) Bll. Mit 2 (wdh.) Druckermarken in Holzschnitt. Pergamentband der Zeit mit goldgepr. Rückenschildchen. 4to. 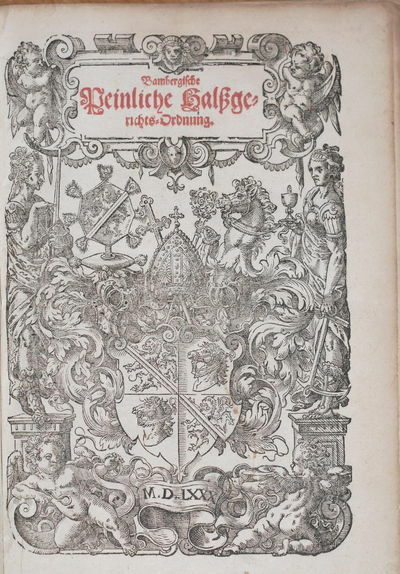 Noch frühe Ausgabe von Giraldis bekanntestem Werk (EA 1565), einer Novellensammlung im Stile Boccaccios und Bandellos, das u. a. Shakespeare die Stoffe für "Maß für Maß" und "Othello" lieferte. Der Literat, Dramatiker, Philosoph und Mediziner Giovanni Battista Giraldi (1504-73) aus Ferrara ist unter dem Namen "Cinzio" bekannt. - Etwas gebräunt bzw. braunfleckig; der zweite Teil stärker wasserrandig. Gelenke angeplatzt. Edit 16, CNCE 40737. BM-STC Italian 305. Diese Ausgabe nicht bei Adams. Vgl. Hayn/Gotendorf II, 714. DES GUERRES DES ROMAINS. livres XI, traduicts en françois par feu maistre Claude de SEYSSEL,... plus y sont adjoutez deux livres nouvellement traduicts de grec en françoys par le seigneur d'AVENELLES. Manuscript document signed. Rome, 13. V. 1580. 1580. Folio. 1 p. on double leaf. Concerning the improvements and building to the Ospedale della Pieta, the well-known convent, orphanage, and music school in Venice, where Vivaldi worked later on. Gregory XIII (born Ugo Boncompagni) is best known for commissioning the Gregorian calendar, which remains the internationally accepted civil calendar to this date. - Minor soiling along lower right edge, scattered abrasions. ANCONA - FLORIMI, Matteo - "La Famosa Città d'Ancona". In basso a destra "Matteo Florimi for. In Siena". 1580. Incisione in rame f. 49,5 x 39, priva di margini con il rigo d'Inquadramento su tre lati, a destra è mancante. Esemplare controfondato e con piccoli restauri. Stampata da Matteo Florimi fine '500 (attivo in Italia dal 1580 al 1612). Molto rara. Osiander, Lucas, Lutheran theologian (1534-1604). Autogr. quotation signed. Stuttgart, 2. X. 1580. 1580. 96 x 85 mm. Latin ms. on paper. Dedication clipped from an album amicorum, quoting Psalm 119: "Beati immaculati in via, qui ambulant in lege Domini" ("Blessed are the undefiled in the way, who walk in the law of the Lord"), signed: "Lucas Osiander D. / Scribebat Stutgardia / 2. Octob. Anno etc. 80". Slightly later ms. authentication by a different hand in bottom left corner. - Lucas Osiander the Elder, son of the great refomer Andreas Osiander (1498-1552), studied theology in Nuremberg and Königsberg. After becoming superintendent of Stuttgart in 1557, he was made Court Preacher to the Prince of Württemberg and member of the consistory two years later. Equally well versed in scholarship and in music, he initiated the first Württembergian songbook (1583) and is probably the author of the Lutheran hymn "Gott Vater, Herr, wir danken dir" (EG [Württ.] No. 557). - Slight browning to edges. Contemporary signed quotation by another scholar on reverse. Mounted to backing paper at left edge by a 19th-c. collector. AGUSTIN Y ALBANELL (Antonio) ]. 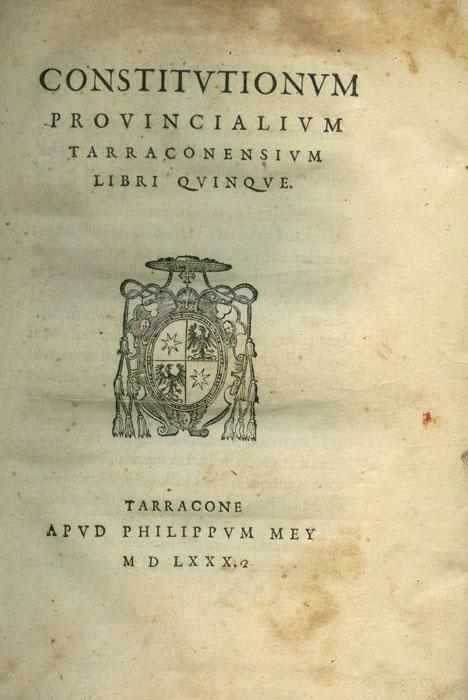 Constitutionum Provincialium Tarraconensium Libri Quinque. Homeri Ilias, postrema editio. Cui originem & exitum belli Trojani addidimus, Coluthi Helenæ raptum: et Tryphiodori Ilij excidium. Latine omnia ad verbum exposita. Et a F. Porto Cretensi inumeris in locis emendata. [Genève], ???? [Eustache Vignon], 1580. In-16, 921--79p. Nouvelle édition entièrement revue de la traduction latine de l'Iliade par François Portus (1511-1581) avec le texte grec en regard. Cet ouvrage est à replacer historiquement dans les travaux homériques de Genève au XVIe siècle. En effet, le texte grec y est clairement fixé et plusieurs traductions latines sont publiées. Cet ouvrage est, semble-t-il, la troisième édition de cette traduction, qui se différencie donc de la précédente (1570) par le soin apporté aux corrections, notamment les traductions trop littérales de certains termes. La traduction de Portus était, à la fin du XVIe siècle, la traduction de référence. Reliure d'époque en parchemin ancien, dos à nerfs, titre à l'encre effacé, petites mouillures claires anciennes, petit travail de vers dans le dos de la reliure, petit travail en marge sur quelques feuillets, une dizaines feuillets tachés à l'encre. Rare édition de cette bonne traduction de l'époque. Orlando furioso di M. Lodovico Ariosto, tutto ricorretto, & di nuove figure adornato. Con le annotationi, gli avvertimenti, & le dichiarationi di Ieronimo Ruscelli. La vita dell'autore descritta dal signor Giovan Battista Pigna. Gli scontri de' luoghi mutati dall'autore dopo la prima impressione. La dichiaratione di tutte le istorie, & favole toccate nel presente libro, fatte da M. Nicolò Eugenico. Di nuovo aggiuntovi li cinque Canti del medesimo autore. Et una tavola de'principij di tutte le stanze. Conaltre cose utili, & necessarie. Venice, heredi di Valgrisi, 1580. 1580. 4to. 2 pts. in 1 vol. (16), 654, (32) pp. With 51 full-page woodcuts in the text and numerous woodcut initials and vignettes. Contemp. limp vellum. Charmingly illustrated edition of "Orlando Furioso". The full-page woodcuts after designs by Dosso Dossi were first used in the 1565 edition. "Ottima edizione sia sul piano iconografico (51 tavole a piena pagina incise in legno) che su quello esegetico: vi sono le annotazioni del Ruscelli, la biografia ariostea del Pigna" (Agnelli). "A c. 2L3r con proprio front. : I cinque canti di m. Lodovico Ariosto" (Edit 16). - Title page rebacked; slight browning throughout; occasional brownstaining. Edit 16, CNCE 2796. Agnelli/Ravegiani I, 151. Adams A 1676. Brunet I, 436. Concionum quae de praecipuis sanctorum festis in ecclesia habentur a festo sancti Andreae, usque ad festum B. Mariae Magdalenae. Antwerpen, Christophe Plantin, 1580. 1580. 2 Tle. in 1 Bd. 527, (1) SS. (2. Teil mit eigenem Titelblatt:) Conciones de praecipuis sanctorum festis, a festo beatissimae Mariae Magdalenae, usque ad finem anni. Ebda., 1580. 542 SS. Beide Teile mit Holzschnittdruckermarke am Titel. Blindgepr. Schweinslederband der Zeit über Holzdeckeln auf 3 erhabenen Doppelbünden mit Resten von Schließen. Hs Rückenschildchen. 8vo. Luís de Granadas Festtagspredigten über das gesamte Kirchenjahr. Der spanisch-portugiesische asketische Schriftsteller Luis von Granada (1504-88) trat insbesondere als Kanzelprediger hervor. "Ludwigs Werke gelten nach Form und Inhalt als klassisch; Franz von Sales nennt ihn 'Fürst der geistlichen Schriftsteller'" (LThK VI, 698). - Durchgehend etwas gebräunt bzw. braunfleckig; zu Beginn auch mit kl. Wurmspuren. Am Titel montierter Besitzvermerk der Kapuziner zu Gmunden. Nicht bei Adams und BM-STC Dutch. 1580. in-8, ff. 4 n.n., legatura d'amatore del XIX secolo in marocchino granata, fleuron impresso in oro al centro dei piatti. Edizione di mitica rarità (apparentemente non censita in nessuna Biblioteca pubblica italiana) di questo componimento eroicomico in due libri in complessive 64 ottave su due colonne. Al titolo magnifica silografia (mm 86x112) raffigurante probabilmente Carlo Magno in trono circondato dai suoi Paladini, il tutto entro bordura geometrica. Si conoscono almeno quattro ristampe di questo componimento nel XVI secolo, tutte rarissime ed edite a Firenze: la prima del 1568 senza note tipografiche, cui seguirono la presente, quella del 1582 del Pagolini e quella, di nuovo del Baleni, del 1597. Nella prima edizione e in quelle successive si fa esplicito riferimento alla fonte ariostesca di questo anonimo componimento ''Con alcune stanze d'Orlando alla Birresca'', invece taciuta nella presente edizione. L'anonimo autore parafrasa infatti i più dolci tormenti d'amore dell'Orlando Furioso trasfigurandoli nelle sofferenze dei debitori perseguitati dai birri (''..d'haver tanti suoi debiti à pagare/da quel martir, da quella frenesia/da quella gente detta Birreria''). Più precisamente vengono riprese la prima e seconda ottava del Canto 31, la prima del Secondo e la quinta del 30simo. ''Le edizioni di questo poemetto sono assai rare. Essendo le prime tre ottave del medesimo simili a quelle che si leggono in altro libretto citate dalla Crusca col titolo di Stanze del Poeta Sciarra (Pietro Strozzi) fu la prima operetta da taluno confusa con la seconda.. si descrivono in essa con istile bernesco varie imprese di carlo Magno e de' suoi Paladini'' (Storia ed analisi degli antichi poemi di cavalleria, IV, pp. 222-223). Rarissima placchetta di interessante componimento cavalleresco in perfetto stato di conservazione. Les Opuscules politiques de François Grimaudet advocat du Roy & de Monseigneur Duc d'Anjou fils & frère du Roy au siège présidial à Angers. A Monsieur Forget Conseiller du Roy en son conseil privé & president és enquetes de sa Cour de Parlement. Paris: Gabriel Buon, 1580. Edition originale, in-8; [8ff. ], 120ff. (Quatorze opuscules suivis des "Excuses de dol"). Relié avec: [GRIMAUDET, François]. Puissance Royalle et Sacerdotale. Opuscule politique. S.l., 1579. Edition originale, in-8; 178p. RELIE avec: Arrest de la Cour de Parlement... publiée en Parlement le 25 janvier 1580, sur la nullité alleguée contre un mariage clandestin prétendu promis par un mineur ayant père et mère... En cest Arrest est inseré le plaidoié de Mre Loys Servin Advocat du Roy. Paris: Chez Jean de Heuqueville, 1601. Edition originale, in-8; 70p. Reliure d'époque en plein veau brun, dos à nerfs orné. Accroc à la coiffe supérieure, courtes fentes en haut des mors, "grignotage" du coin supérieur de quatre ff. (pp. 169 à 176) avec perte de quelques mots sur deux ff., autrement en bon état. Divers opuscules politiques traitant de la loi et de l'équité; de la sagessse des gouverneurs; de l'office du magistrat concernant la recompense des merites & infliction des peines; que Prudence doit etre joincte avec Justice; si les biens des subjets appartiennent aux Empereurs & Roys; qu'utilité ne se peut separer de Justice & honneteté; s'il est vray qu'un Empire, un Royaume & une Republique ne peuvent maintenir sans injure & injustice; de l'abus de l'éloquence... Les "Excuses de dol" qui terminent le premier ouvrage sont précédées d'un sommaire. Barbier, III, 1110d pour le second ouvrage, "Puissance Royalle et sacerdotale", de toute rareté en édition originale, dans lequel Grimaudet revient sur un thème qui lui est cher et lui valut vingt ans plus tôt la condamnation de l'Eglise et un séjour à la prison d'Angers. Venezia, Curti, 1663, 1580. In-4. Cartonatura rustica originale, titolo calligrafato sul dorso. Antiporta inc. con al centro veduta a volo d'uccello di Venezia, e ritratto di Martinioni f.t. (12), 760 (mal num. 754), 86, (10), 24, (72) pp. ; lieve uniforme ossidazione della carta e qualche macchiolina; buon esemplare intonso e marginoso. Terza e migliore edizione, importante per le notevoli aggiunte. «Nel Martinioni poi riescono di utilità i cataloghi posti alla fine, cioè degli uomini letterati dal 1600 al 1663, dei dottori nel clero veneto, dei medici, degli avvocati, dei pittori, degli scultori» (Cicogna 4467). Cicognara 4380. Fossati Bellani 2395. Third, greatly enlarged and best edition. Engr. frontispiece with a bird's eye view of Venice in the centre, and a portrait of Martinioni. Mild uniform toning of the paper and a few light stains here and there, but a good uncut copy in original boards. Georg Rabe for Sigmund Feyerabend, 1580. In folio, elegante legatura coeva o di poco posteriore in marocchino bordeaux, piatti entro filettatura a secco con fregi angolari in oro e grande fleuron centrale pure in oro, dorso a cinque nervi rifatto recentemente con ferri in oro simili a quelli dei piatti, tagli rossi (qualche spellatura ai piatti), pp. (12), 742, (42).&middot,Marca di Feyerabend sul frontespizio. Iniziali e fregi xilografici. Grande stemma del dedicatario Wilhelm von Hessen inciso in legno alla carta )(2r. Leggermente fiorito e brunito per la qualità dell carta, ma ottima copia proveniente dalla biblioteca del cardinale Alessandro d'Este (suo timbro sul titolo). Sontuosa edizione curata da Hermann Cruser. Il De Homero liber (pp. 705-742) è invece curato da Wilhelm Xylander. VD16, P-3684. Lettre d'annoblissement accordée à Jean Vetus, seigneur d'Argent, conseiller, Maître des requêtes de l'Hôtel du Roi, à lui et à ses descendants légitimes, en reconnaissance des services rendus au Roi défunt (Charles IX) et au Roi lui-même. Parchemin (420x550 mm) frippé, lacet cordonnet de soie rouge, verte et jaune, cachet de cire verte (brisé avec manques), daté de mai 1580, signé Henry sous replis et Brulart (Nicolas Brulart, marquis de Sillery, secrétaire d'Etat, futur Chancelier de France). Né à Saint-Amour, Jean Vétus reçu la charge et office de conseiller au Parlement de Bourgogne en date du 11 juillet 1569 (document signé par Catherine de Médicis au nom de Charles IX) ; en 1571, il fut reçu conseiller au Parlement de Bretagne, nommé par Charles IX et en 1581, il deviendra Président du Parlement de Bretagne en la Chambre de la Tournelle. (VUES DE TOURS, MONTPELLIER, POITIERS). BRAUN - HOGENBERG. Mons Pessulanus, Montpellier - Turo, Tours - Pictavis, sive Pictavia. [Cologne], [ca 1580]. Gravure sur cuivre en coloris d'époque, comprenant trois vues légendées en français et en latin: Montpellier 23,5 x 15,5 cm; Tours 23,5 x 15,5 cm; Poitiers 48,5 x 15,5 cm (dimensions de la feuille 54,5 x 41 cm). Texte en latin au dos. Bel exemplaire. 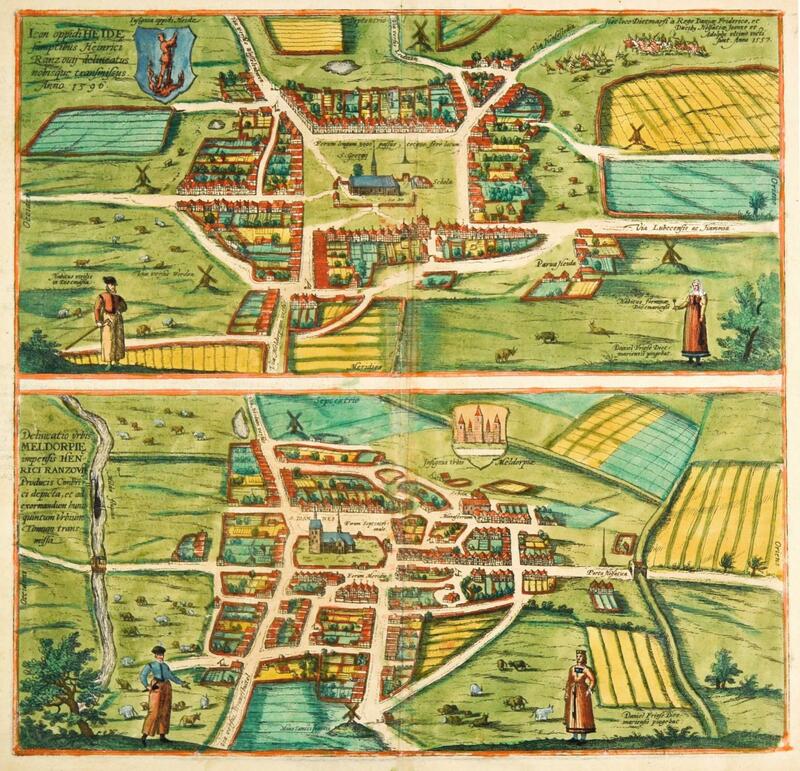 Jolies vues cavalières des villes de Montpellier, Tours, et Poitiers, extraite du "Civitates Orbis Terrarum" de Braun, Van der Novel et Hogenberg, premier atlas de vues de villes publié à Cologne à partir de 1572. Une légende en français présente les principaux monuments de chaque ville. APUD HAEREDES MELCHIORIS SESSAE, 1580. In 16. Dim. 15,5x10,5 cm. Pp. 114+(5). Rara edizione del 1580 di questa nota opera del filosofo e umanista spagnolo Jean Luis Vives (Valencia 1492-Bruges 1540). Costretto a lasciare il suo paese a causa dell'Inquisizione nel 1509 studiò a Parigi per poi trasferirsi a Bruges. Con quest'opera, pubblicata per la prima volta nel 1538, Vives tentò un rinnovamento nell'insegnamento della lingua latina proponendo lo studio attraverso dialoghi su temi quotidiani (giochi, Mendoza, vestiti e sveglia al mattino, casa, scuola, convivio, giochi di carta, regole dei giochi, corpo degli uomini, educazione ecc..). Alla fine dei dialoghi annotazioni di Pedro Mota e parte finale sulla scrittura delle lettere. Numerose antiche annotazioni manoscritte ai margini. Bella legatura ottocentesca in mezza pelle con titolo su tassello al dorso. Purtroppo l'ultima carta bianca risulta mancante. Paret del titolo colorato a mano. Numerazione singola. Bel frontespizio con vignetta e parte del titolo entro cornice. Raro, solo tre copie censite su EDIT 16 Copertina in mezza pelle ottocentesca con titolo in oro al dorso in buone condizioni generali con lievi usure ai margini e segni di tarlo al dorso. Legatura in buone condizioni. All'interno le pagine si presentano in buone condizioni con rare fioriture e qualche gora di umidità. Piccola parte mancante a pag. 16 senza perdita di testo. Qualche macchia nel testo e segno di usura a pag. 44 con piccola perdita di testo. Segno di tarlo e restauro al margine di piegatura delle prime due carte senza perdita di testo. Scarce edition of 1580 of thsi scarce work by the spanish phylosopher and humanist Jean Luis Vives (Valencia 1492-Bruges 1540). 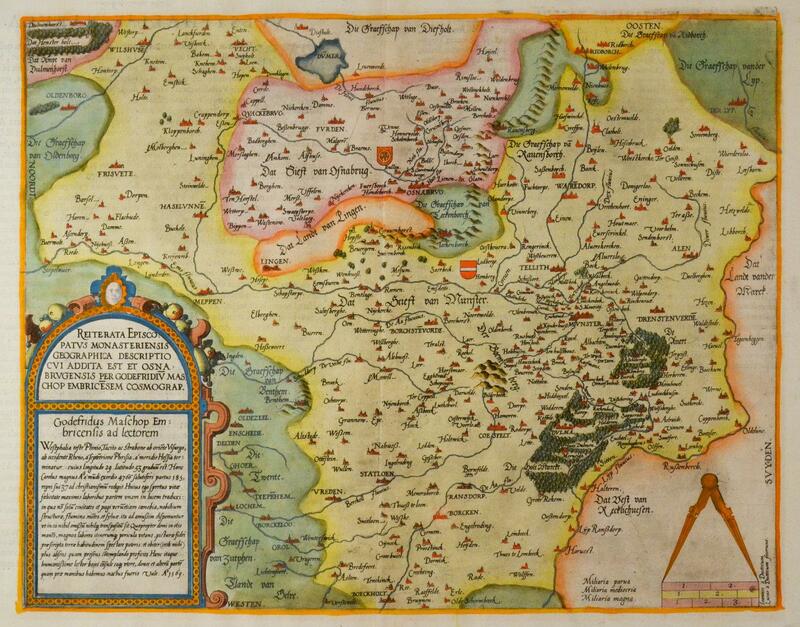 Vvives was forced to leave his town in 1509 due to Inquisition, he studied in Paris and then moved in Bruges. With this work, published for the first time in 1538, Vives tried a renewing in teaching of latin language proposing its study through dialogues on daily themes (games, Mendoza, dresses and wake up in the morning, house, school, lunch, paper games, rules of games, body of men, education etc..). At the end of the dialogues notes by Pedro Mota and final part about writing of letters. Different ancient manuscripted notes in the edges. 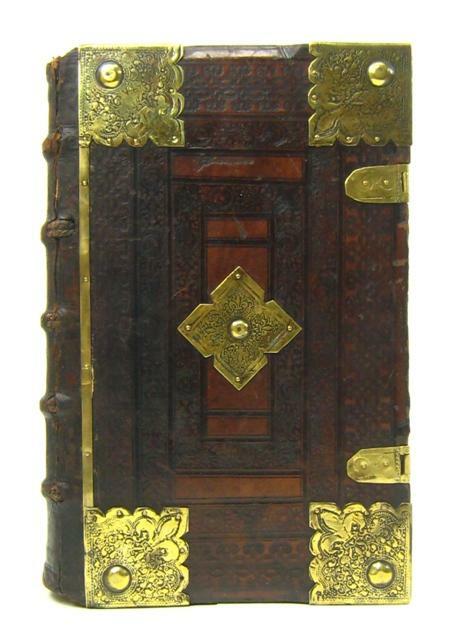 Beautiful half leather cover of the XIX century with golden title in the spine. Unfortunately the last white page is missing. Single numbering. Beautiufl title page with vignette and part of the title in a frame coloured by hand. Scarce copy. 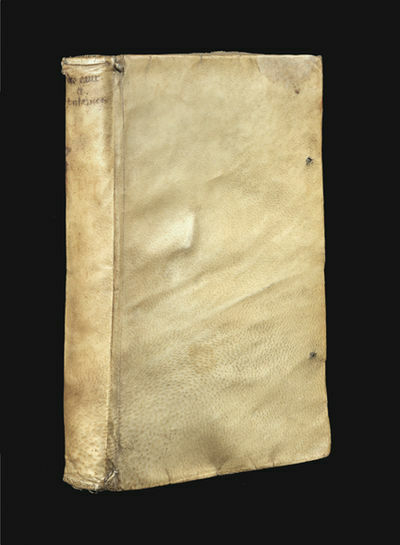 Half leather cover of the XIX century with golden title in the spine in good general conditions slightly worn in the edges and with wormings in the spine. Binding in good conditions. Inside pages are in good conditions with occasional foxings and some humidity stains. Some missing part in pag. 16 with no loss of text. Some stain in the text and wearing in pag. 44 with slight loss of text. Womring and restauration sign in the folding edge fo the first two pages with no loss of text. Aristotelis Stagiritae Opera Omnia, Quibus nunc primum accesserunt Politicorum seu de Republica, liber nonus & decimus : Item Theologiae, seu Philosophiae Mysticae liber quatuordecim (6 volumes/7). Apud Jacobum Berjon, 1580 (tomes : 1.3.4.5.7. ), 1608 (tome 6), 6 volumes de 7.5x11.5 cm environ, tome I. (1) ff., 637 pp., (1) ff., - tome III. (1) ff., 972 pp., (1) ff., - tome IV. (1) ff., 842 pp., (2) ff., - V. (1) ff., 903 pp., (1) ff., - Tome VI. (1) ff., 751 pp., 112 pp. (index) - tome VII : index non paginé environ 500 pp. Pleines reliures brunes, dos lisses avec pièces de titre rouges, titres tomaisons et fleurons dorés, encadrements des plats d'un filet doré avec petit motif à chaque coin, tranches finement mouchetées. Une coiffe légèrement ébréchée, une autre avec un petit manque de cuir, quelques restaurations anciennes sur les pages de titre, quelques coins légèrement émoussés, rares trous de ver sur 2 mors. Ensemble satisfaisant, rare malgré l'absence du tome 2. ACQUAPENDENTE/Latium. "Aquapendente". Gesamtansicht (17 x 48 cm), darunter "Tarvisi". Gesamtansicht (18 x 48 cm) von Treviso im Veneto. - Kupferstich aus Braun-Hogenberg, um 1580, 36,5 x 48 cm. Fauser 65 und 14215. - Die Ansicht von Treviso mit vier großen Kostümfiguren und Kartusche mit Erklärungen 1 - 11. L'Orlando con I Cinque Canti di M. Lodovico Ariosto, I quali seguono la materia del Furioso. Tutti di nuovo revuisti & ricorretti da molti importantissimi errori, che fin qui sono flati in tutti glialtri. Con Gli argomenti in rima, & discorsi di M. Luigi Grotta d'Adria, con alcune brevi et importanti annotationi del medesimo. In Venetia, appresso Nicolo Moretti, sans date (vers 1580), 1 volume de 185x255 mm environ, (1) f., 1 page de titre avec au verso la planche de la p. 534, 654 pages, (16) ff. (table), (1) f., reliure plein vélin crème, titres dorés sur pièce de titre havane, tranches marbrées. Complet des 50 gravures. Un mors interne fendu, p. 1 restaurée dans la marge, des rousseurs et mouillures, petites galeries de ver dans les marges internes sans atteinte au texte, petites notes manuscrites anciennes dans les marges et passage encadré, manque la p. 533/534, début de fente sur la coiffe supérieure, sinon bel exemplaire.Ludovico Ariosto dit L'Arioste (né le 8 septembre 1474 à Reggio d'Émilie et mort le 6 juillet 1533 à Ferrare) est un poète italien de la Renaissance.Impression Venitienne à partir de celle de Felice Valgrisi. Magdeburg - " Magdeburgum ". Gesamtansicht aus der Vogelschau mit großer Kartusche, Stadtwappen und Schriftband, im Vordergrund übergroß vier Personen in Ranaissance-Kleidung. Kolorierter Kupferstich aus Braun-Hogenberg um 1580. - Veduta cartografica in oblungo, più volte ripiegata, raffigurante la Terra Santa, 18 piccoli riquadri ai margini mostrano il tempio e i suoi strumenti. Cartografata e stampata da Jacobus Tirinus (1580 - 1636), la carta uscì ad Anversa nel 1632. La carta presenta al centro la pianta di Gerusalemme basata sul celebre modello di Villalpando, pubblicato nello "Hierosolymae Veteris Imago". Rara. Esemplare stampato su carta fine, carta velina applicata al verso, stretti margini, una piccola abrasione interessa la parte centrale del foglio e una, rimarginata, la parte sinistra dell'inciso da un terzo superiore del foglio fino al margine inferiore. Nell'insieme resta comunque fruibile la lettura della carta e l'esemplare si presenta con una buona impressione dell&#146;inciso. Marescotti Giorgio, 1580. in - 4, pp. (40) , 829 , (1 f. bianco), emblema del tipografo sul titolo, iniziali istoriate. Splendida legatura di fine XVI sec. in marocchino granata (lievissime tracce d'uso alle cerniere ed alle cuffie) alle armi di Jacques - Auguste de Thou e della sua prima moglie Marie de Barbançon de Cany, esemplata nel 1587 da Le Gascon. I piatti adorni di triplice riquadro di filetti e al centro impresse in oro le armi accoppiate dei De Thou e Barbançon; dorso liscio con titolo, filetti e monogramma oro intrecciato "IAM" (Jacques - Auguste e Marie) ripetuto 5 volte, tagli dorati. Da notare che l'intersezione tra la A e la M forma la greca theta (Thou). Splendido volume proveniente da una delle più importanti biblioteche cinquecentesche: J.A. de Thou (1553 - 1617) fu canonico di Notre - Dame, e Presidente del Parlamento di Parigi (contribuì alla promulgazione dell'Editto di Nantes), storico (scrisse la "Storia del suo tempo" e le sue "Mémoires"). Fu tra i più raffinati bibliofili del suo tempo, raccogliendo oltre 9000 volumi: fece rilegare i suoi volumi con le proprie armi e il proprio monogramma, unendovi le armi della prima moglie e poi quelle della seconda moglie, Gasparde de La Chastre e con il monogramma "IAGG". Prima edizione di rara storia di Firenze scritta nel quattrocento da Dom. Boninsegni (1384 - 1466) e pubblicata dal figlio minore Piero. Esemplare di gran pregio (ex - libris Chatsworth collection). APUD IOANNEM BELLERUM SUB AQUILA AUREA, 1580. In 24. Dim. 13x8 cm. Pp. (36)+370+(24).Rarissima edizione senza data ma del 1580 della nota leggenda "Barlaam Iosaphat". Il racconto, attribuito a San Giovanni Damasceno (676-749) e popolarissimo in età medievale narra la conversione di Iosafat per merito del Santo eremita Barlaam. Sembra che la storia venne in realtà ricalcata sul modello della vicenda della conversione del Buddha. San Giovanni Damasceno venne dichiarato dottore della chiesa nel 1890. Opera redatta a cura di Georges Trapezuntius. Alla fine del volume la breve opera "De comparatione regis et monachi" di Giovanni Cristostomo a cura di Germain Brice. Antica firma al frontespizio e sottolineature all'interno. Bella legatura in piena pergamena coeva con titolo manoscritto al dorso. Rarissimo, solo sette copie censite su ICCU. Collazionato e risultato completo. Copertina in piena pergamena molle seicentesca con titolo manoscritto al dorso in buone condizioni generali con lievi usure ai margini e dorso. Dorso coperto da pergamena. Lacci di chiusura mancanti. Legatura in buone condizioni. All'interno le pagine si presentano in buone condizioni con rare fioriture. Segni di tarlo al margine destro: a pag. (20), 43, 67, 113, 305, 329, 353 senza perdita di testo. A pag. 19, 91, 161 con perdita di qualche porzione di lettera. Gore d'acqua al margine inferiore delle prime 4 carte. Very scarce not dated edition but of around 1580 of the famous legend "Barlaam Iosaphat". The tale, attribuited to Saint John of Damascus (676-749) and very popular in Middle Age talks about the conversion of Iosafat for the merit of the Heremit Barlaam. It seems that the history was in reality compared on the model of the happening of conversion of Buddha. Saint John of Damascus was declaired doctor of church in 1890. Work redacted by Georges Trapezuntius At the end of the volume the brief work "De comparatione regis et monachi" by Giovanni Cristostomo by Germain Brice. Ancient signature in the title page and underlinings inside. Beauitufl full parchment coeval cover with manuscripted title in the spine Very scarce work. Collationed and complete. 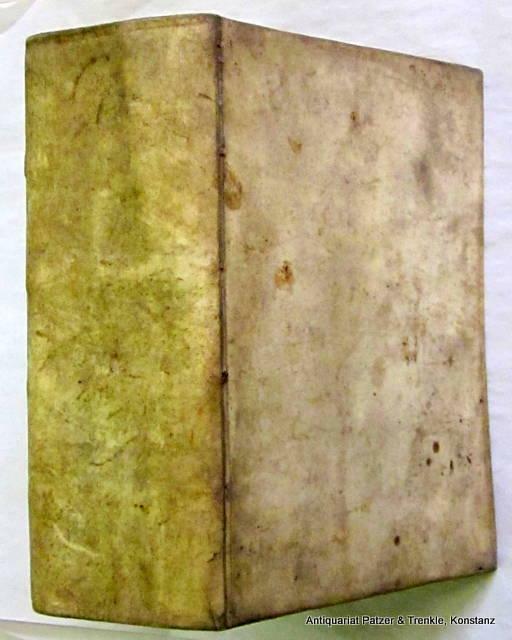 Full parchment coeval cover of the XVII century with manuscripted title in the spine in good general conditions slightly worn in the edges and spine. Spine covered by parchment. Binding in good conditions. Inside pages are in good conditions with occasional foxings. Worming in the right edge: in pag. (20), 43, 67, 113, 305, 329, 353 with no loss of text. In pag. 19, 91, 161 with loss of some portion of letter. Humidity stains in the lower edge of the first 4 pages.